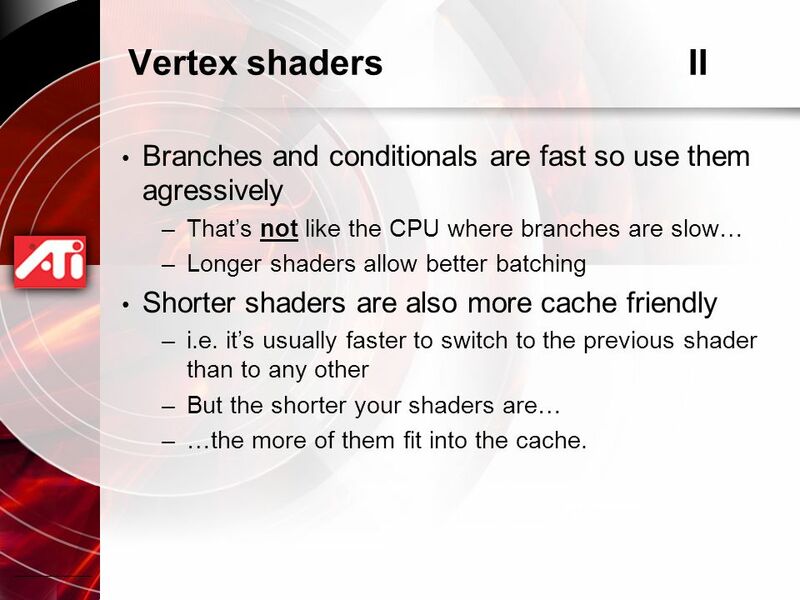 14 Vertex shadersII Branches and conditionals are fast so use them agressively –That’s not like the CPU where branches are slow… –Longer shaders allow better batching Shorter shaders are also more cache friendly –i.e. 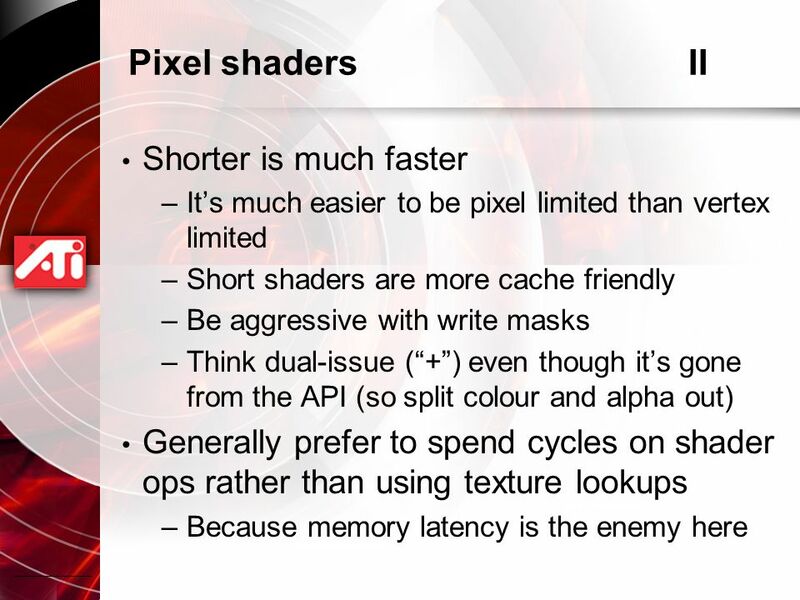 it’s usually faster to switch to the previous shader than to any other –But the shorter your shaders are… –…the more of them fit into the cache. 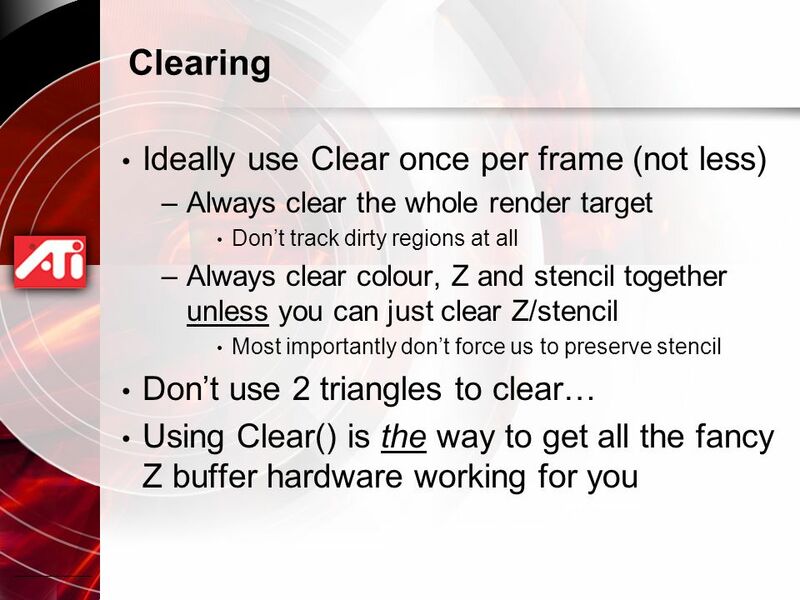 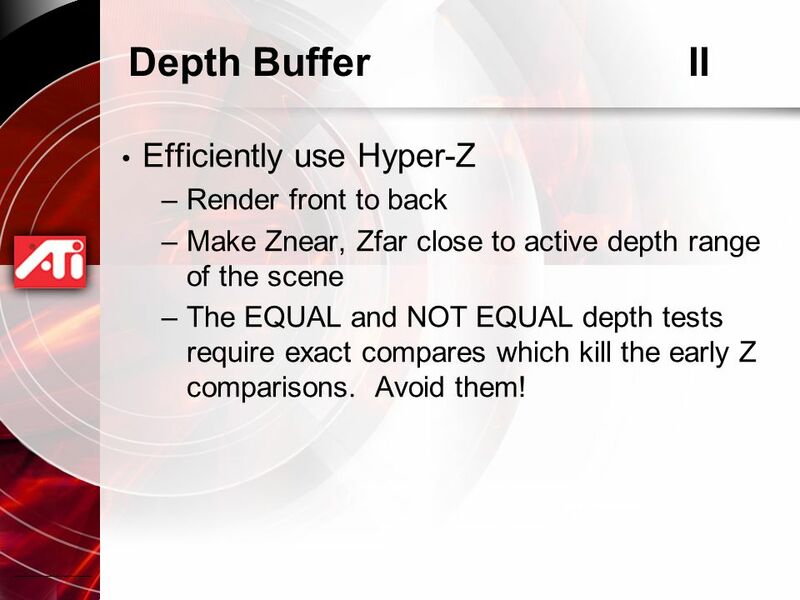 27 Depth BufferII Efficiently use Hyper-Z –Render front to back –Make Znear, Zfar close to active depth range of the scene –The EQUAL and NOT EQUAL depth tests require exact compares which kill the early Z comparisons. 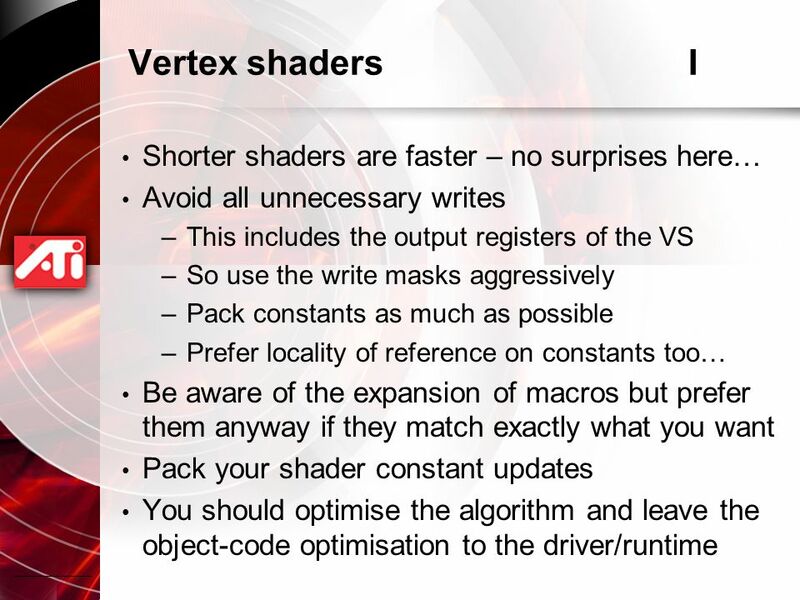 Avoid them! 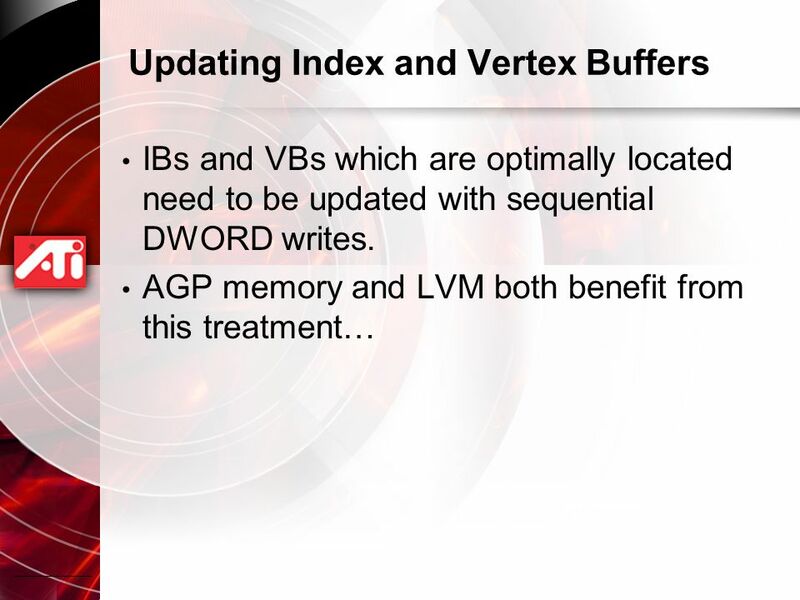 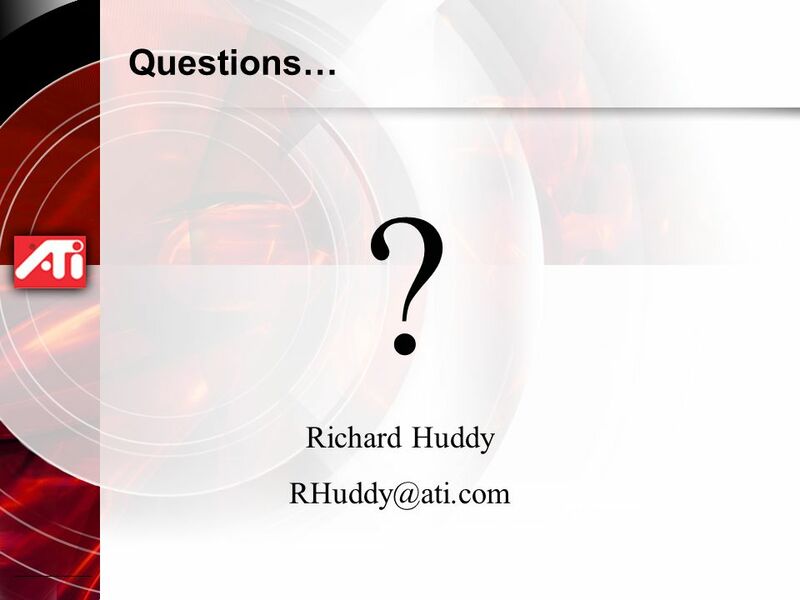 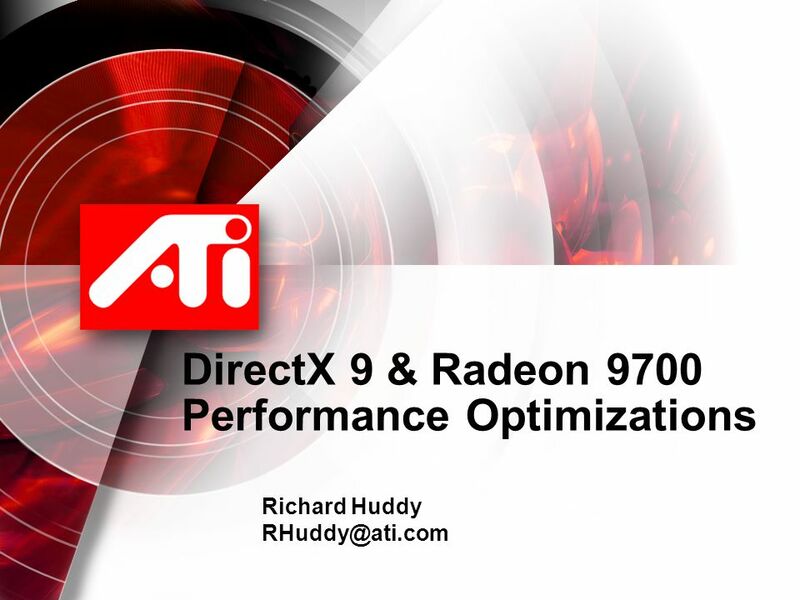 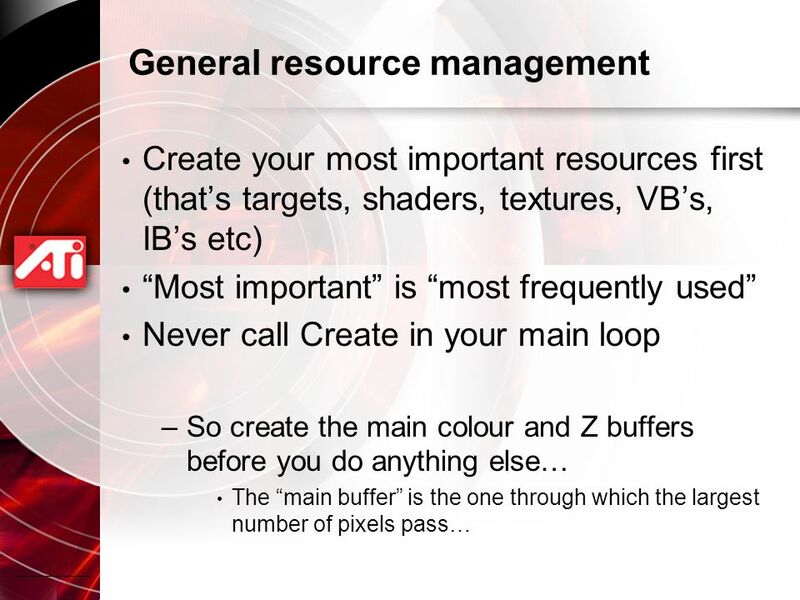 Download ppt "DirectX 9 & Radeon 9700 Performance Optimizations Richard Huddy"
Debugging Tools Tim Purcell NVIDIA. 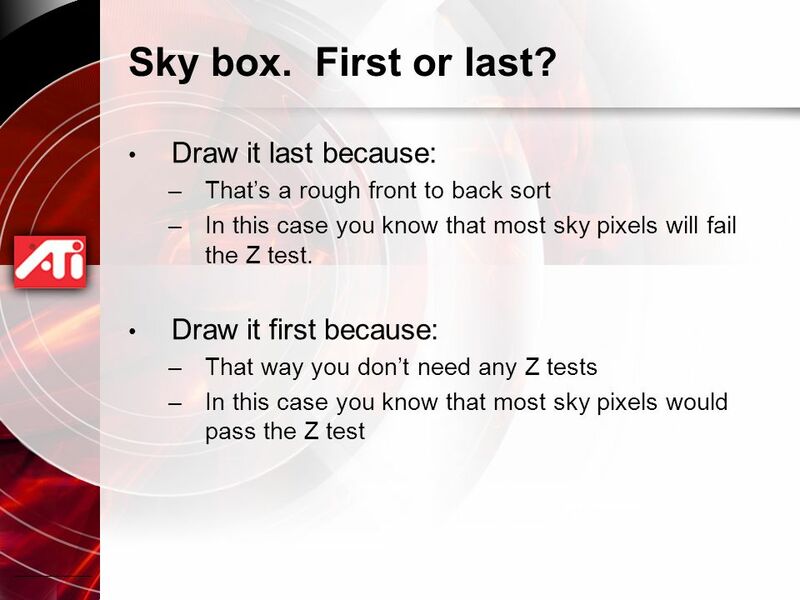 Programming Soap Box Successful programming systems require at least three ‘tools’ Successful programming systems. 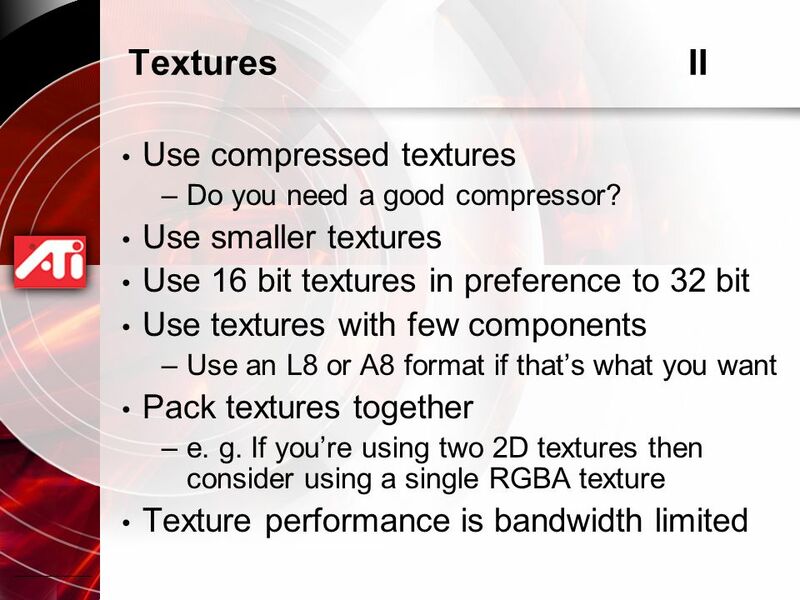 Normal Map Compression with ATI 3Dc™ Jonathan Zarge ATI Research Inc.
CS 352: Computer Graphics Chapter 7: The Rendering Pipeline. 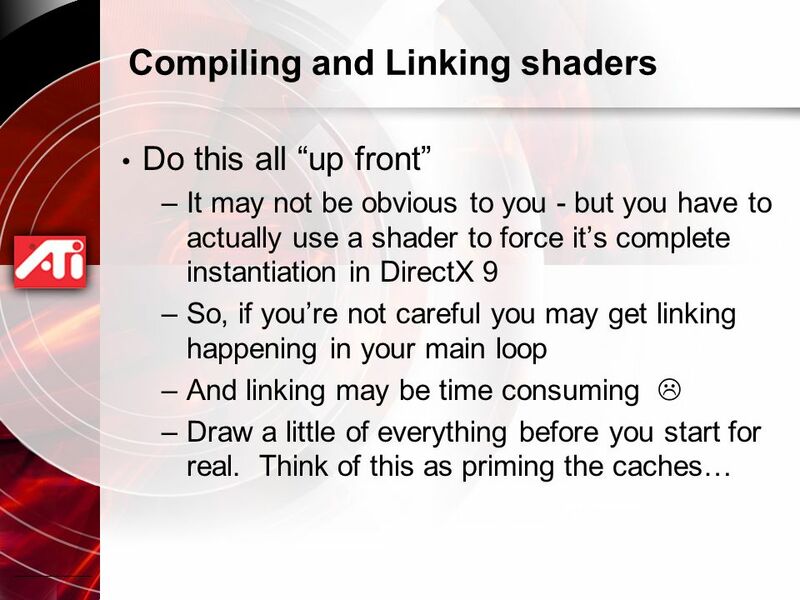 Understanding the graphics pipeline Lecture 2 Original Slides by: Suresh Venkatasubramanian Updates by Joseph Kider. 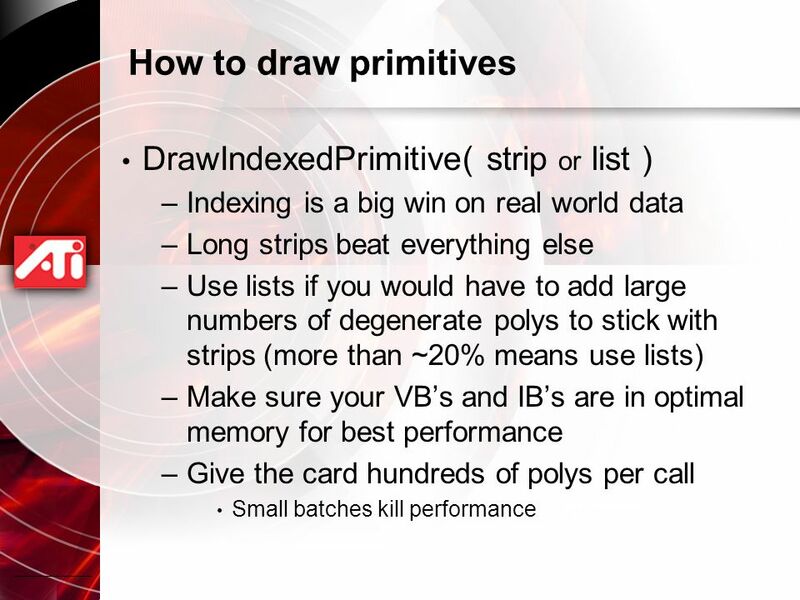 Status – Week 257 Victor Moya. 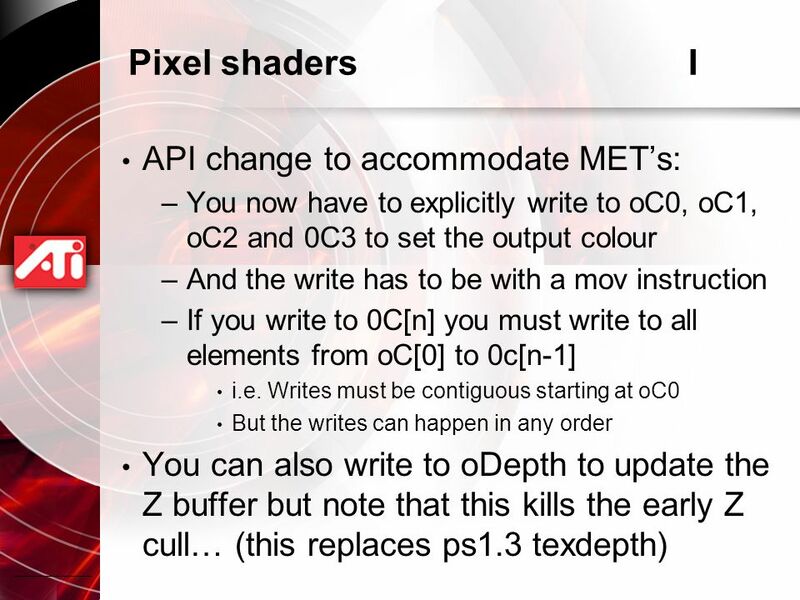 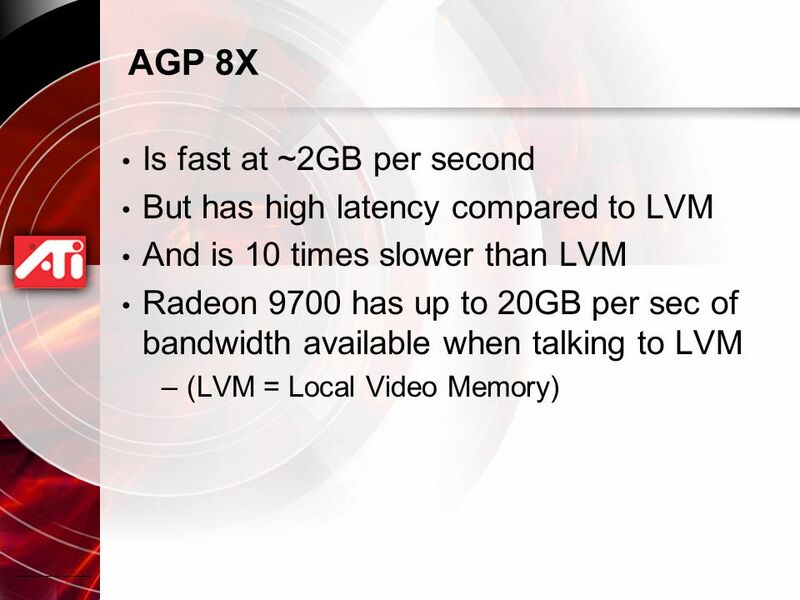 Summary GPU interface. 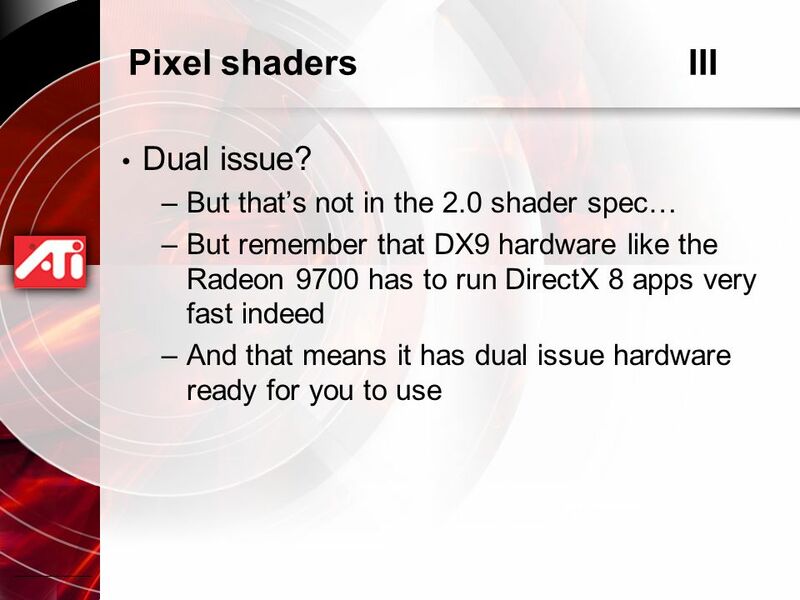 GPU interface. 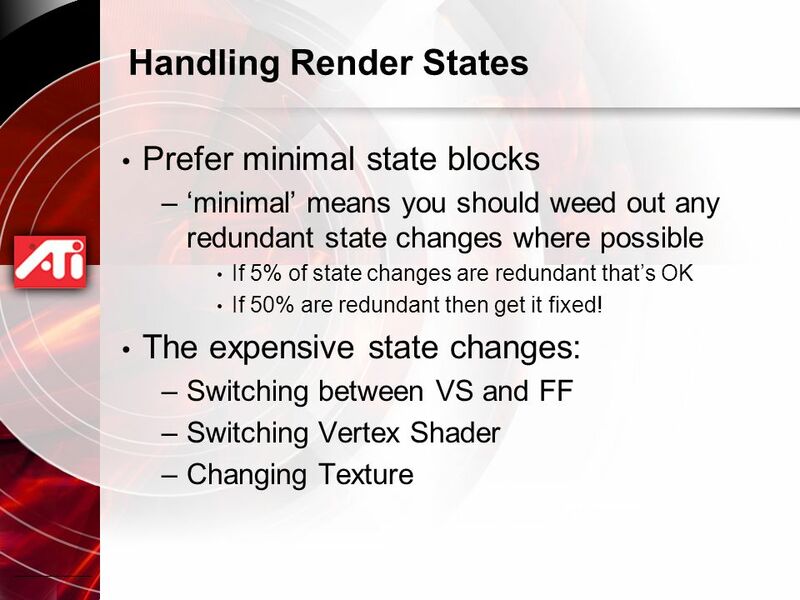 GPU state. 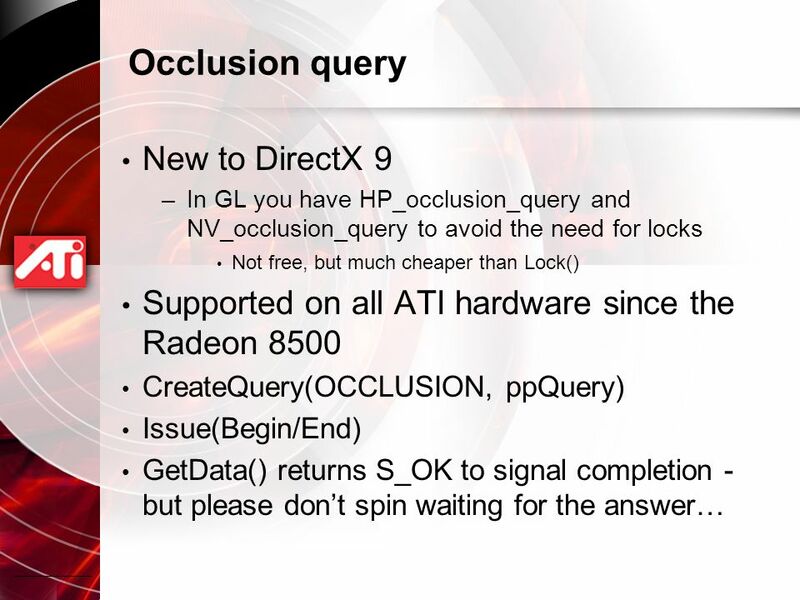 GPU state. 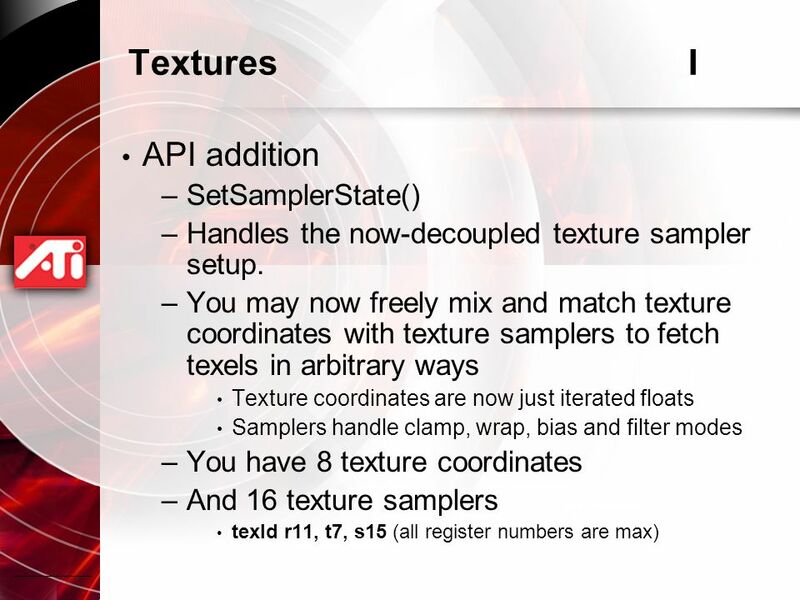 API/Driver State. 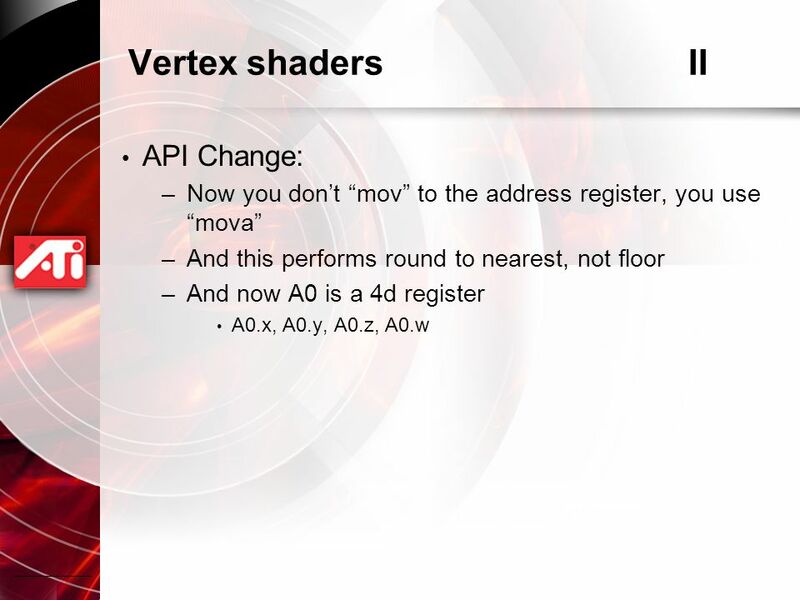 API/Driver State. 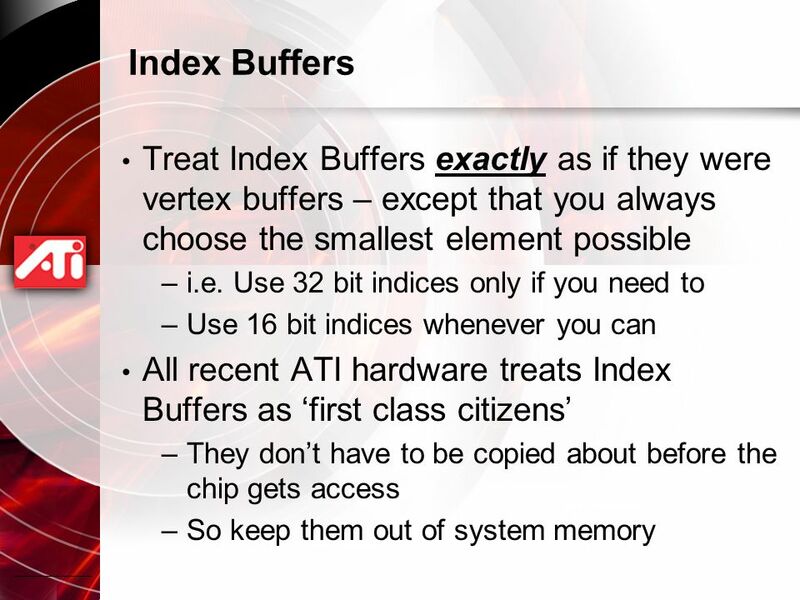 Driver/CPU Proxy. 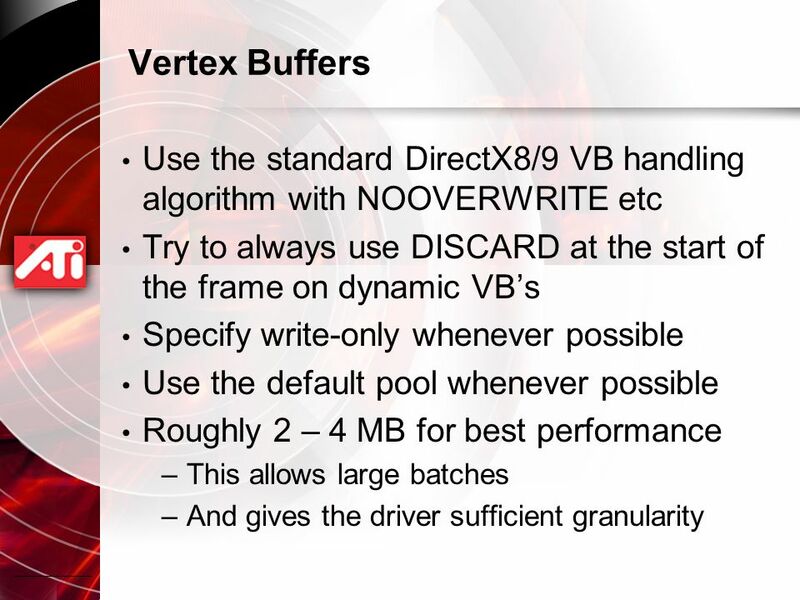 Driver/CPU. 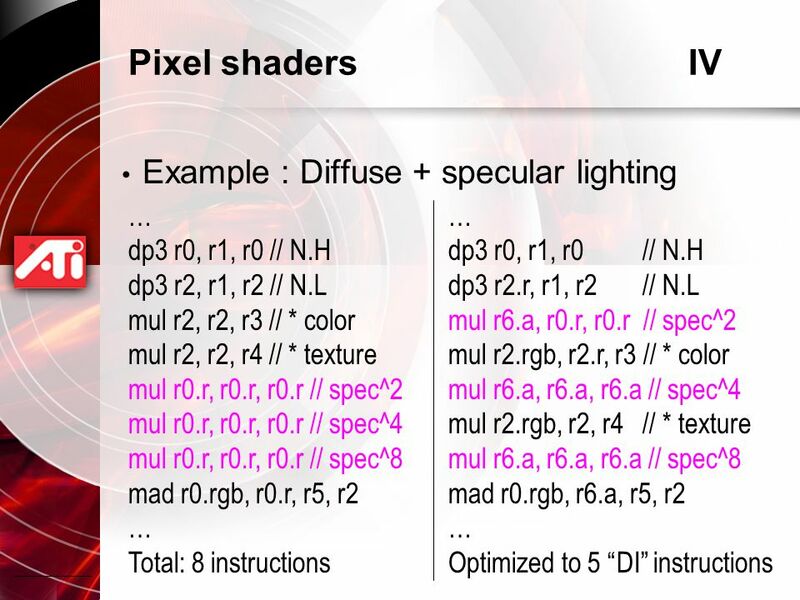 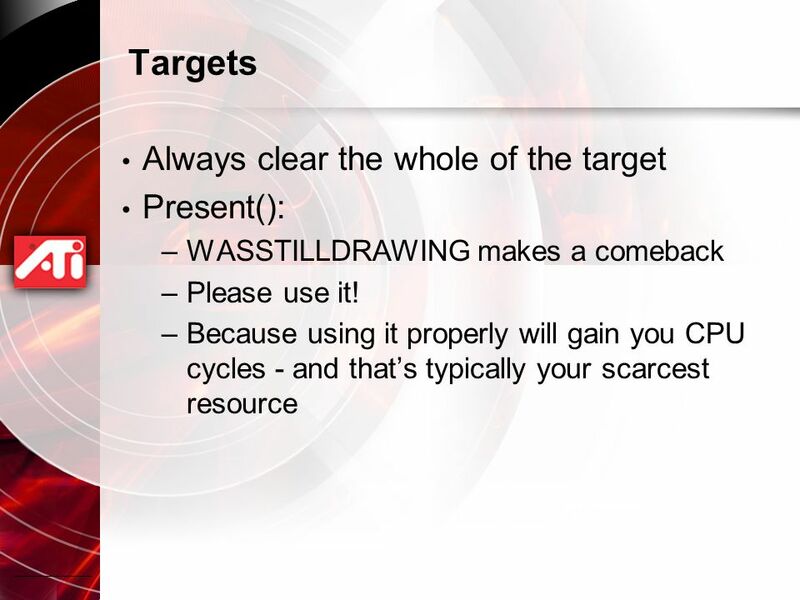 CS 4363/6353 BASIC RENDERING. 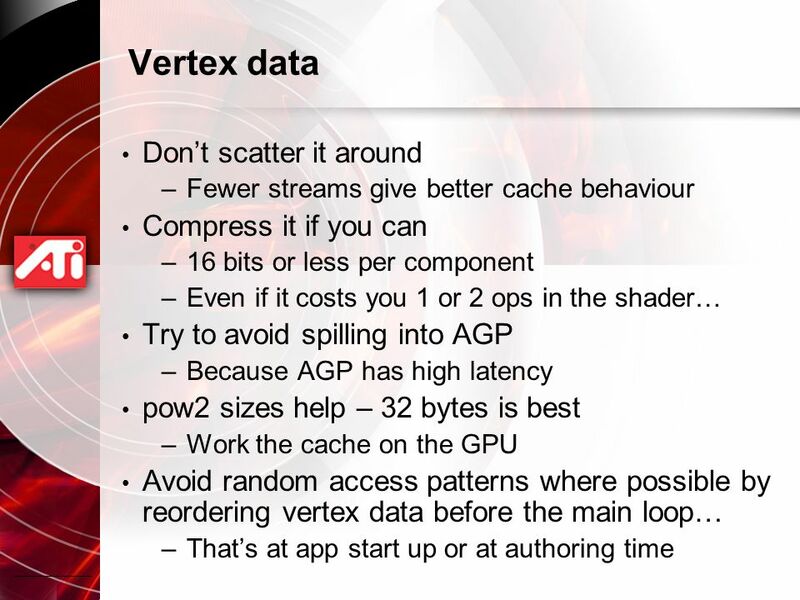 THE GRAPHICS PIPELINE OVERVIEW Vertex Processing Coordinate transformations Compute color for each vertex Clipping and Primitive. 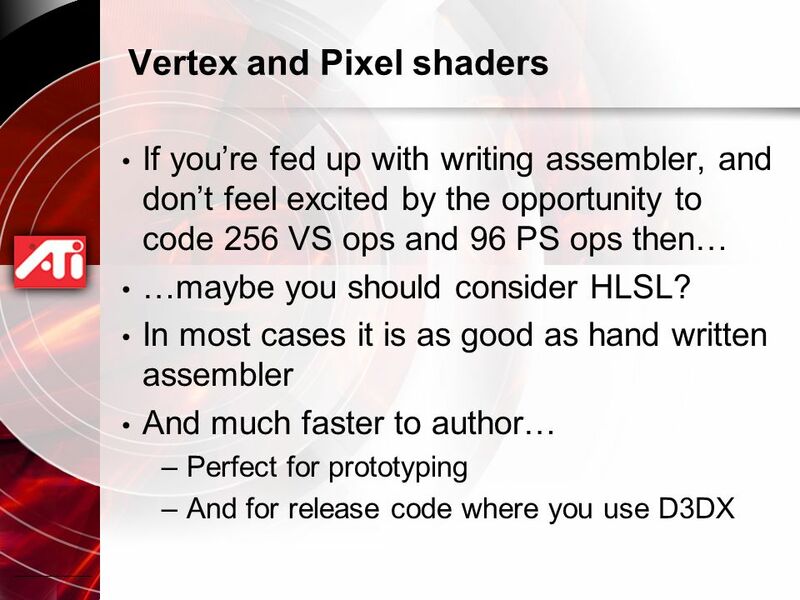 Graphics Hardware CMSC 435/634. 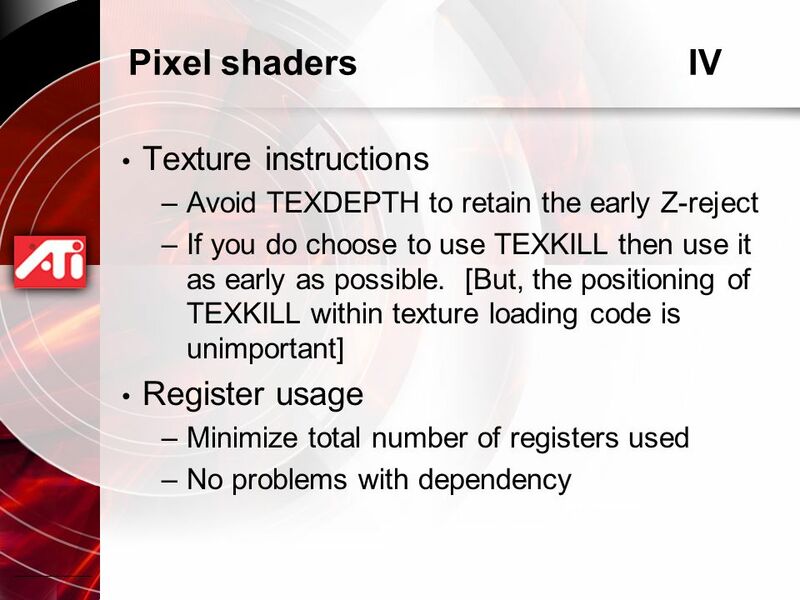 Transform Shade Clip Project Rasterize Texture Z-buffer Interpolate Vertex Fragment Triangle A Graphics Pipeline. 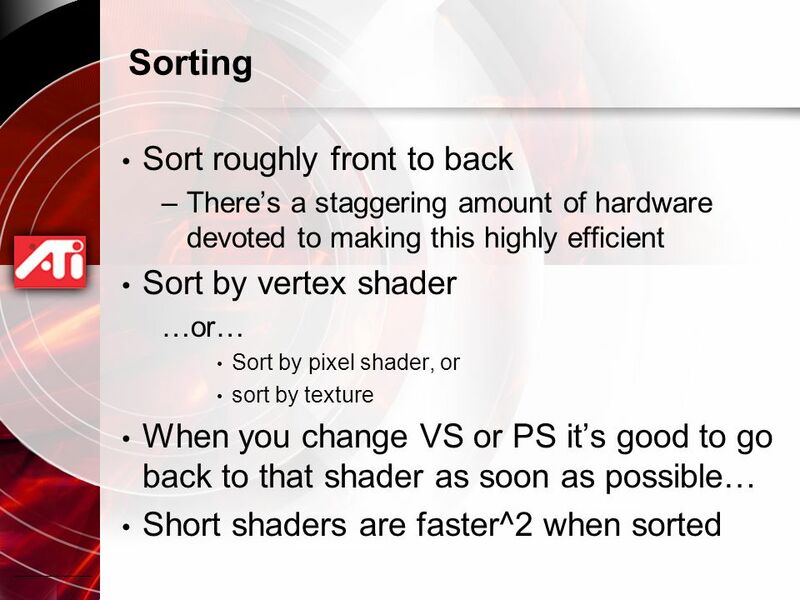 Texture Mapping. 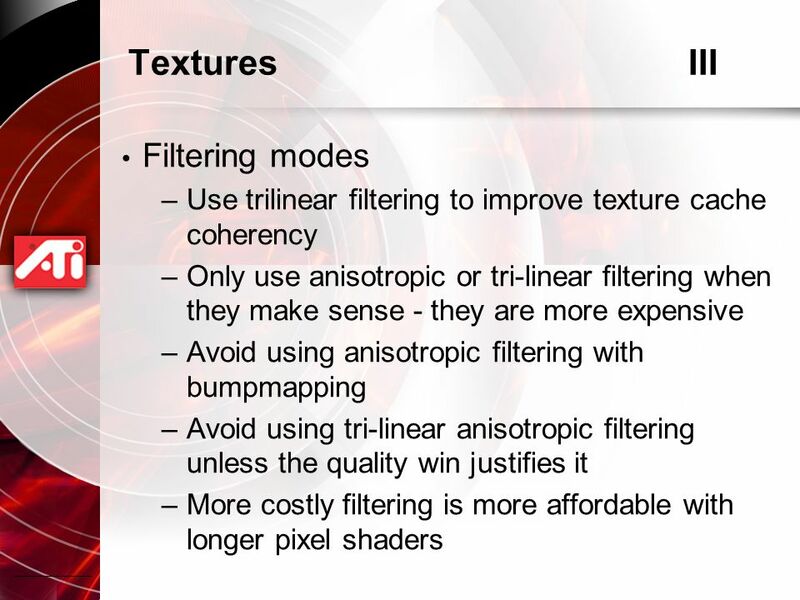 Texturing  process that modifies the appearance of each point on a surface using an image or function  any aspect of appearance can. 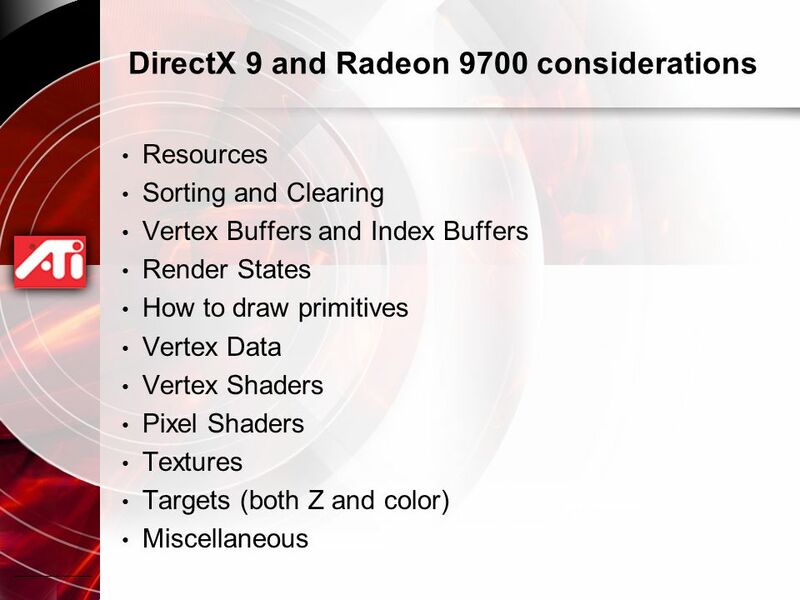 GAM666 – Introduction To Game Programming ● As of DirectX 8, DirectDraw (2D) and Direct3D (3D) have been combined into DirectX Graphics (still often called. 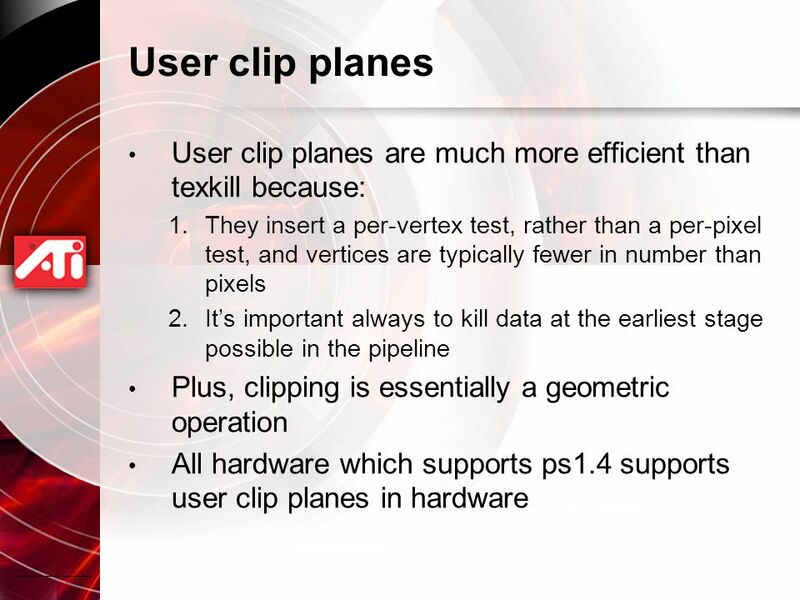 CS-378: Game Technology Lecture #9: More Mapping Prof. Okan Arikan University of Texas, Austin Thanks to James O’Brien, Steve Chenney, Zoran Popovic, Jessica. 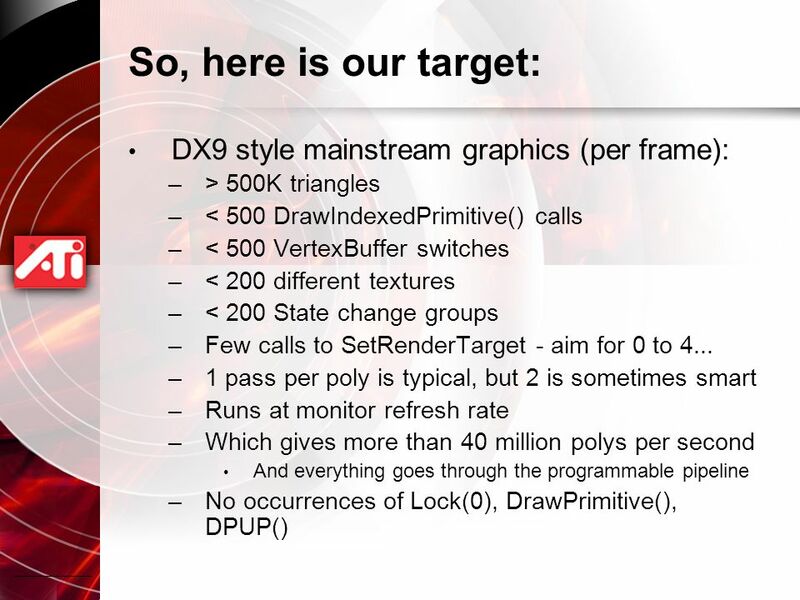 A Crash Course on Programmable Graphics Hardware Li-Yi Wei 2005 at Tsinghua University, Beijing. 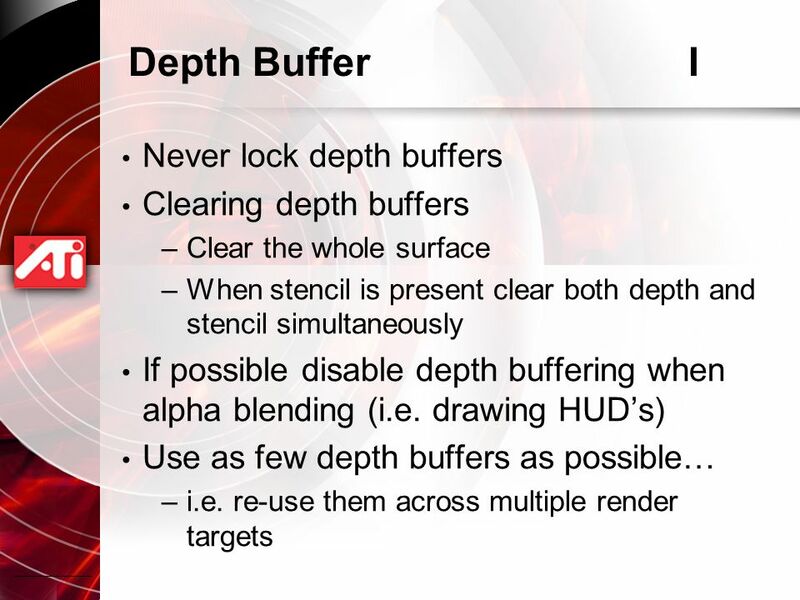 Z-Buffer Optimizations Patrick Cozzi Analytical Graphics, Inc.